Just when we thought Bet365 Vegas couldn’t possibly do anything else to amaze us, the site has added yet another brand new neon-blasting Net Ent gaming production to its hall of mobile gaming fame!. The brand new multi-coloured, flashy game is sure to blow us all away and comes in the shape of Dazzle Me Touch! 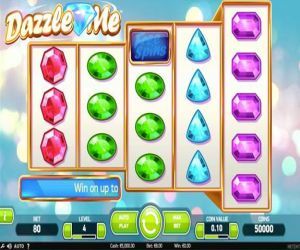 The new Dazzle Me Touch slot game seems to offer all the winning ingredients for a spellbinding mobile hit, and follows in the footsteps of the recent hot additions to the bet385 site, Sparks Touch and Magic Portals Touch. The electrifying video slot game offers 5 reels and a jaw-dropping 76 bet lines of dazzling slot magic. The reels are full to the brim and ready to explode with a myriad of multi-coloured, neon shiny gems, as well as plenty of flashy features, Free Spins and dazzling chances to win! The team of genius developers have crafted the game using HTML 5 technology, to ensure accelerated game-play, eye-popping features and seamless technology across mobile platforms. If all that's not enough, Dazzle Me Touch has a few spectacular treats and fiery features in store to mesmerize players and keep them in suspense. Throughout the game players will stumble across Dazzling Wild Reels, the Free Spins feature, Scatters and the classic Linked Reels. These are sure to add some extra spice to the adventure and spell even more dazzling wild wins!